In case you haven’t noticed, 98 Degrees have been creeping into your life this holiday season. They’ve been in my holiday music rotation since 1999 when the then Motown-signed group released This Christmas. 98 Degrees dropped a brand new Christmas album in October titled, Let It Snow. To support the new songs, band members Nick Lachey, Jeff Timmons, Drew Lachey and Justin Jeffre have been making the rounds on national television appearances, like the Macy’s Thanksgiving Parade, Good Morning America and The Today Show, as well as performing live on Top 40 radio, like Z100. Peppered in between appearances, 98 Degrees are currently on a 31-city tour across the U.S. I caught their show in Long Island and was pleasantly surprised to see a side I hadn’t seen too much of from the guys on stage: theatrics! The stage was set simply and fittingly with a few snowflakes. There was no big lighting changes or effect–just the four men who adorned our walls once upon a time and who still steal our hearts. However, this 98 Degrees didn’t just verify they still have talent with their amazing a cappella chops, 4-part harmony, muscular bodies, and the sweetest, most personable smiles, but that they are also showmen! The guys added much more choreography than expected. 98 Degrees was always known as the “boy band who can’t dance”. We’re used to seeing them sitting on stools or doing exaggerated hand movements without really having to dance. Nick Lachey is often heard making fun of his dancing ability, or lack there of–even on his recent participation on season 25 of “Dancing With The Stars”. 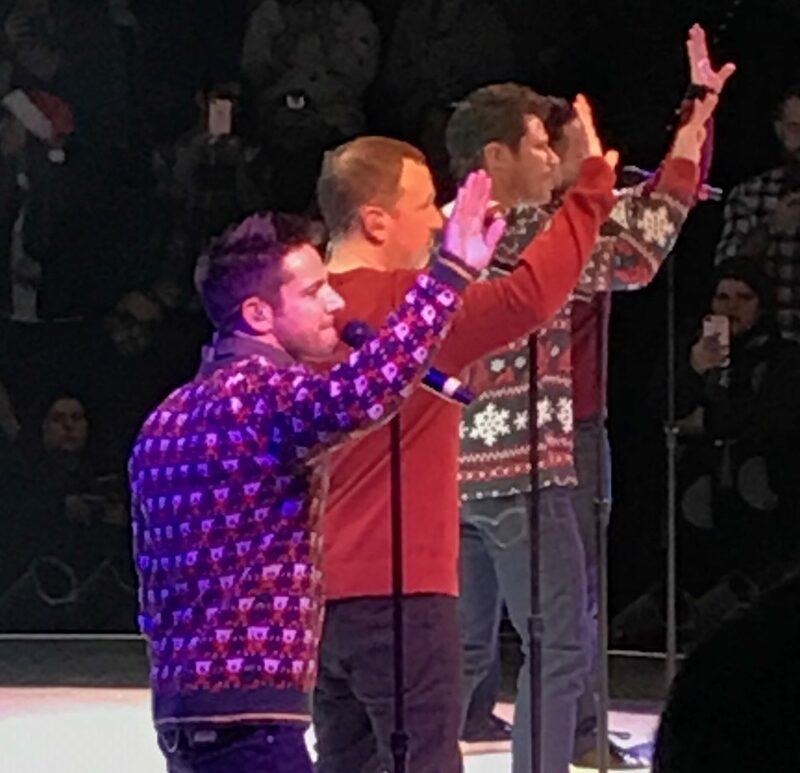 Along with their hits, “Invisible Man”, “The Hardest Thing” and “Because Of You”, 98 Degrees filled most of the show with Christmas music from their two holiday albums, often being cheeky with choreography or exaggerated facial expressions. They even did a cover of “You’re A Mean One, Mr. Grinch” and Frozen hits, “Do You Want To Build A Snowman?” and “Let It Go”. Brothers Nick and Drew ballroom danced together and leapt around the stage as if they were Elsa and Anna while Justin and Jeff got into their own holiday characters. The band shared personal stories from their holidays as children and now with families of their own. It was an intimate show that really did feel like a gift, especially when the group performed one of my favorite Christmas songs, “This Gift”. If you’re looking for a holiday show to see this year, 98 Degrees gets the job done! If you can’t make it to one, make sure you have both This Christmas and Let It Snow on hand to make your season bright. And set your DVR on November 30th for ABC’s Wonderful World of Disney: Magic Holiday Celebration!